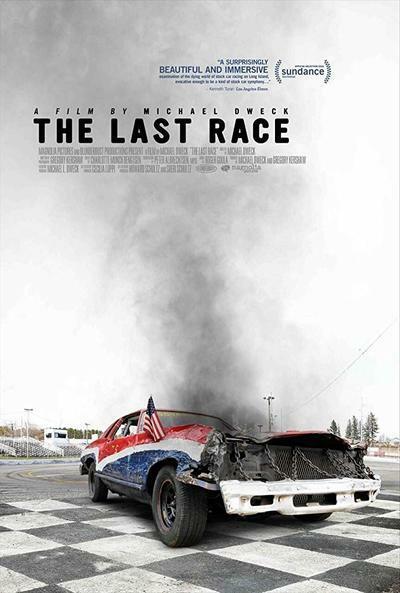 You don’t have to be an avid fan of stock car racing to emotionally appreciate photographer-turned-filmmaker Michael Dweck’s “The Last Race,” a somber portrait of vanishing Americana. In fact, you don’t need to have a taste or affinity for cars or speed-races at all, as Dweck’s patiently observed homage to a tumbledown, proudly-ran racetrack in Long Island’s Riverhead isn’t so much about the sport itself. “The Last Race” instead is an empathetic examination of the traditional lifeline of a tight-knit community, threatened to be torn apart by an inevitable capitalist takeover. As Dweck visually surveys the key blue-collar players of the dignified yet rough-around-the-edges Riverhead Raceway, he almost instantly touches a sorrowful nerve amid all the hand-built, rattling race cars and a stacked-up, mom-and-pop-style office—so quaint that its central cluttered work-desk seems to be permanently taken over by an adorably snoozing toy dog. Throughout “The Last Race” it’s simply impossible to stay indifferent to the sight of local heroes who might lose their seasonal triumphs to corporate greed. Right from the start, Dweck unsubtly reminds us that this has happened before—a number of informational title-cards quietly lead the viewer into the noisy trances of the racetrack. Turns out, the Long Island of 1927 is where it all started for stock car races. Over the years since then, there had been as many as 40 speedways in the area, with Riverhead being the only survivor that managed to resist becoming an overstuffed discount megastore or a shopping mall, like a local, historically significant airstrip one turned into in the mid-1950s. This loaded intro infuses Dweck’s film with a second layer of life-or-death stakes, in addition to the thrill and danger of stock racing his intimate camerawork and impressive sound design wholly capture. Full disclosure: I did not view “The Last Race” in a theater with a professional sound system. But even on my TV screen and through my modest speaker, the experience was rousing, and at times, aptly distressing, especially when cinematographer Gregory Kershaw (also the co-writer of the film along with Dweck) seizes the airless claustrophobia of a race car, alongside the desperation of teary drivers, helmeted and buckled up inside of their coffin-like craters. A pair of well-selected movements from Mozart’s Requiem (one directly translates into “Day of Wrath”) accompany these hair-rising scenes to a stirring effect. But “The Last Race” isn’t all made up of noise and rah-rah, as its world, despite containing some macho eruptions, couldn’t be further away from NASCAR’s. Commendably, Dweck opts for long takes and little talk, and lets the environs do all the explaining through repetition and accumulation of on-screen details. You will be surprised about the amount of texture and breadth of specificity his economically parsed 74 minutes manage to pack in, without ever feeling tedious or overindulgent. His studious photographic compositions of both the unkempt outdoors and the charmingly untidy office of Jim and Barbara Cromarty (the aging couple that owns and refuses to sell the Riverhead Raceway) obliquely recall the intimate charms of JR and Agnès Varda’s “Faces Places.” I admit to pausing my review screener in a number of places just to take in the level of care Dweck caresses his hypnotically illustrative scenes with. A gallery of vivid, socially conscious photography, “The Last Race” owes much of its artful strength to the filmmaker’s resistance to being prescriptive about his unambiguous socio-economic message. When we aren’t in the glory of the circular races and cheap-looking trophies over a weekend, he patiently follows the weekday lives of the track’s various, purposely unnamed stakeholders, as they make ends meet through ordinary jobs that even include pest control in contrastingly affluent areas of Long Island. To Dweck’s credit, he doesn’t draw pity for his subjects as they strive to hold on to their valuable land and protect it from greedy realtors we hear from briefly. Perhaps a little too muted and brief for its own good, “The Last Race” eventually passes the strange beauty it sees in an unusual place on to anyone who will care to look at it with compassion.